Having recently revisited Basket Case 3: The Progeny, I felt (sadistically) compelled to go backwards and remind myself exactly what happened in 1990�s Basket Case 2. Picking up where writer/director Frank Henenlotter�s (Frankenhooker) seminal 1981 classic left off, we come upon Duane Bradley (Kevin Van Hentenryck) and his surgically-separated Siamese Twin brother, Belial, as they�re recovering in a hospital. It isn�t long before the more monstrous of the two brothers, Belial is up to his old, murdering tricks again, and the two have fled the hospital. What follows is much more of the same mirth and mayhem that, with at least a slightly larger (albeit still miniscule) budget in tow, results in a much higher quotient of blood and gore. Fortunately, we have a great way to take in the blood, guts, and just plain insanity, as Synapse�s DVD release of Basket Case 2 is a great one. As with the third film, we�re immediately treated to a brief recap of the events that occurred at the end of the original Basket Case. After that and the aforementioned, brief hospital scene, we get to the good stuff, an entirely new road that Henenlotter takes Duane and Belial down. It centers around the best part of the sequel, the addition of veteran character actor Annie Ross (Superman III, Short Cuts) as Granny Ruth, a mysterious old woman who has a strange obsession with the brothers. It isn�t long before we discover that she has her own odd family; one that at least Belial will fit right into. Ross is clearly having fun with this material, which one would hope she at least found a little ridiculous when the script arrived at her door, only resorting to over the top antics when they benefit the film. She�s a consummate professional throughout in this performance, which I like to think of a gateway to her incredibly, can�t miss scene where she�s singing on a bus full of freaks in Basket Case 3. Other than Ross, the other �human� cast members are amongst some of the worst actors you�ll even seen, with Van Hentenryck seemingly in a class (below Community Theater-caliber) of his own. This is fun stuff, indeed! Synapse�s DVD release is a huge step up from the old disc that Anchor Bay used to offer. The best improvement is in their brand new, 1.78:1 anamorphic widescreen image that is the product of a brand new, high-definition transfer taken from the original 35mm negative. It�s hard to believe Basket Case 2 could even look as good as it does here, as crystal clear, detailed images are a constant, and even the inherently drab color scheme shows some signs of vibrancy at times. There�s still a bit of grain and dirt, but this is seemingly unavoidable, and, most importantly, never distracting. Unfortunately, this sounds like the old Dolby Digital Stereo audio mix, but, at least the dialogue is crisp and always easy to understand, while the music cues are well-integrated into the track as well. We don�t get a large number of extras, but the ones that are here are worth a look. 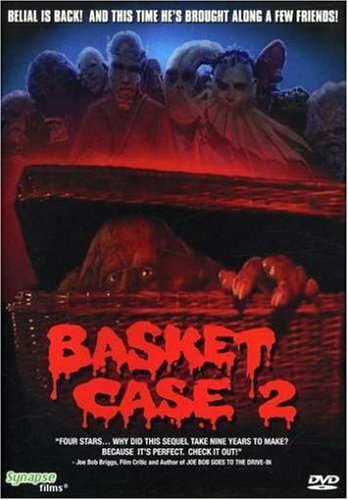 Beyond the Wicker is a 22-minute piece that is a ton of fun, as special effects make-up artist Gabriel Bartolos takes us on a tour of the making of Basket Case 2 by introducing us to on-set footage, as well as a recent discussion with Frank Henenlotter. The other extra is The Man in the Moon Mask, a six-minute interview with actor David Emge, (best remembered from his work in the original Dawn of the Dead) who plays the freak known as Half Moon. There�s some good, candid stuff here from Emge, who goes into great detail about the foam-rubber head he had to wear during the shoot.